Jessica Harper, a native of Delaware, was never one to take it easy. For ten years as a single mom, she raised three children while working and taking college classes at night. With her hard-earned Bachelors Degree in hand, she went full speed ahead to earn her Masters Degree in Social Work. As a Social Worker, Jessica worked for several agencies over the years, including Delaware Hospice, where she gained an appreciation for its mission of quality of life at the end of life. In February 2012, when Jessica’s world was shattered with the diagnosis of a terminal illness, quality of life at the end of life became her personal mission. With her experience as a social worker on a Delaware Hospice care team, Jessica knew well the support they offered to patients and families, and she decided to turn to them for help during the months that remained. “My nurses arrive with a big smile and lift my spirits. They really care about how I’m doing and listen to what I’m saying. They are excellent with pain management, which is my primary concern. They work with me as my condition evolves, finding the right medication and adjusting doses to best manage my symptoms. I’ve called them many times, and no matter how silly the question, they’re always happy to answer and assure me that it’s not a bother. Most of all, I appreciate the fact that they treat me with such respect, kindness and gentleness. Jessica was always the planner of the family, organizing parties and get-togethers, and making sure everything was done right. Now, as much as ever, she wants to be sure her family is prepared for the inevitable. She said, “A terminal illness is a family situation and each member of the family needs support, so it’s important to me that the Delaware Hospice team members care for the family and not only for the patient. Jessica looks forward to her Delaware Hospice chaplain’s visits as well. “We have good discussions. He challenges me to focus on what’s important with my faith, and he’s helped me come to terms with some unresolved issues. Ever the planner, we’ve already organized my funeral. It will be tough enough, and this will make it easier on my family. Since 1982, Delaware Hospice has provided exceptional care and support to 41,500 patients and their families. Its mission is to help each patient, each day, live the fullest, most comfortable life possible. Delaware Hospice is the largest and only licensed, nonprofit, community-based hospice serving Delaware and southern Chester and Delaware counties in Pennsylvania. Delaware Hospice is honored to be accredited by the Joint Commission, the nation’s leading health care standards-setting and accrediting organization. Delaware Hospice was voted as a 2011 Top Workplace in an employee survey by Workplace Dynamics and the News Journal. 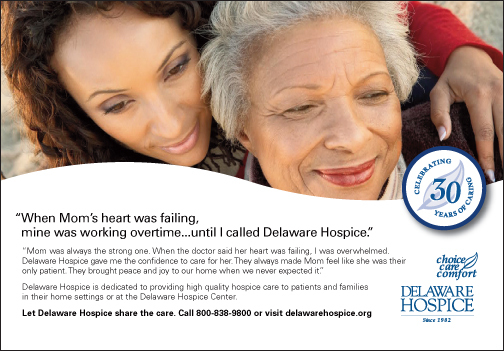 For more information about Delaware Hospice’s programs and services, upcoming events, or employment opportunities, call 800-838-9800 or visit our website, www.delawarehospice.org. ← Previous Story How Would You Like Smoother,Younger Looking Skin? Look No Further!